The camera with the quality your photos deserve, the EOS Rebel T6 can be ideal for smartphone or digital point-and-shoot camera users looking to step up their imaging game. It's equipped with an 18.0 Megapixel CMOS image sensor and the DIGIC 4+ Image Processor for highly detailed, vibrant photos and videos even in low light. The EOS Rebel T6 camera has an 18.0 Megapixel CMOS sensor that captures images with outstanding clarity and tonal range, and can offer enough resolution for big enlargements or crops ? your photos can be printed and framed without having to worry about reducing the image quality. This sensor is APS-C size for an effective 1.6x field of view (compared to 35mm format) and features many advanced Canon technologies that maximize each pixel's light gathering, helping to ensure images are captured beautifully and brilliantly. ISO 100-6400 (Expandable to H: 12800) With a broad range of light sensitivity ratings from ISO 100?6400 (expandable to H: 12800), the EOS Rebel T6 camera is ready to go in virtually any light, capturing fine detail with ease. Thanks to this expanded ISO range, it can capture a variety of subjects in a variety of situations, including handheld, without needing a flash. This means detailed and natural-looking pictures and movies can be captured discreetly, with ease. Built-In Wi-Fi and NFC Connectivity From uploading photos to select social networking sites, emailing family and friends or archiving images to a computer, the EOS Rebel T6 camera offers a number of easy solutions for sharing. It?s equipped with built-in Wi-Fi? * connectivity to help make wireless sharing of photos between compatible devices incredibly easy and convenient. Using Canon's free Camera Connect app*, the EOS Rebel T6 can connect to a number of compatible smart devices* for image browsing and transfer, and also post images and videos to select social media sites. 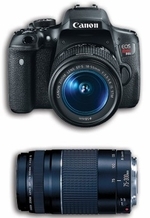 Full HD Movie Mode The EOS Rebel T6 camera offers easy-to-use video capture with breathtaking Full HD quality. Capable of shooting in a number of recording sizes and frame rates, the EOS Rebel T6 offers outstanding video capturing performance, quality and simplicity ? simply press the dedicated Live View/Movie Recording button to get started. Additionally, the EOS Rebel T6 enables easy manual control of exposure, focus and Live View features and even allows for in-camera editing. A wide ISO range means you can record in a variety of lighting situations. And with a wealth of over 60 interchangeable lenses available to choose from, your video has plenty of creative options. US Appliance is a division of ABC Warehouse and an authorized Canon dealer. When paying by credit card, if you wish to ship to an address other than your billing address, please contact your issuing bank and have your shipping destination added as an authorized alternate ship-to address. This is a precautionary measure we perform to ensure your safety and deter fraudulent activity.